Julia Roberts and longtime co-star George Clooney will soon share something special in common: He too will be a parent to twins. The actor's wife Amal Clooney is pregnant with a baby boy and a girl, who are due in June. Roberts said on The Ellen DeGeneres Show Friday that she has given George advice about parenthood but did not say what she told him. "It's gonna be so fun. They are a great couple and I think they don't need advice from me or anybody else," she said. She did, however, paint a 100 percent accurate picture of what parenthood is like for the first few weeks. "Also, you know, nobody's there with you at 3 o'clock in the morning when you're just going, 'What am I doing? Where did they come from and when are they going?'" she said. "And then you sort of, you get through it and you figure it out and everybody does and it's a trial and error and a whole lot of tears and it's amazing." Roberts and husband Danny Moder are parents to twins Hazel and Finn, 12, and son Henry, who will turn 10 next month. "I have three incredible kids and to think about when they were teeny-tiny...it goes so fast," the actress said. E! News had previously learned the Clooneys plan on raising their children in the U.K., where Amal has lived for years and where the couple owns one of their homes. The couple has also decided that after the twins come home, they won't hire a live-in or full-time nanny and instead have a night nurse help set a sleeping schedule. Amal's mother, journalist Baria Alamuddin, has also expressed that she would like to help out. George has signaled diaper duty is something he can handle. "Hang on for a minute. 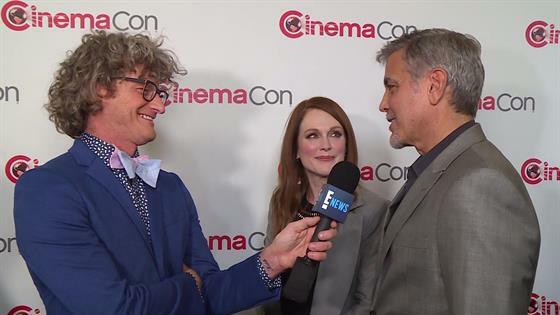 I played a pediatrician on ER," Clooney told E! News' Marc Malkin in March.